The Honda Activa is the most popular scooter in the country today. With thousands of these scooters hitting the new roads every day, standing out from the rest of the other Activas on the streets is quite hard. However, a video from Youtuber BLC Biker may just have the most unique Activa in the country today. So just what makes is it that makes this Activa so special? The answer is simple – it’s electric. This electric Honda Activa shows the famous Indian Jugaad at work once again. The electric Activa is the work of a Pathankot based man who goes by the name of Prince. 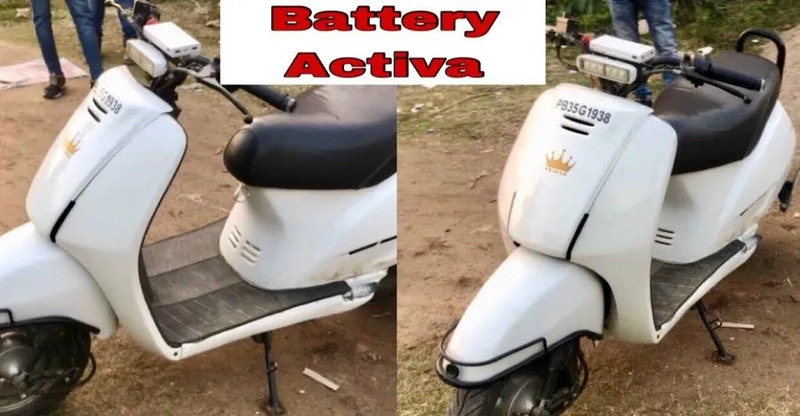 Prince has built the electric Activa to his own specifications, which has ended up costing him a cool Rs 56,000 including the Rs 4,000 spent to purchase the Activa from the scrap heap. The whole process took him around 5 years to do but this included the time taken to bring the costs down. So what all has this DIY electrification genius done to make this rather unique Activa. The scooter features an 800W hub motor which Prince acquired from Mumbai for around Rs 20,000. With the help of new motors and imported in from China and Japan, Prince refurbished and upgraded the motor to a 2.5kW unit. The motor delivers enough power to propel the electric Activa to a top speed of 65 km/h. Prince has added a safety feature in the form of a 2 gear transmission which is operated by the old choke unit for the Activa’s old engine. When the choke is pulled open, the Activa goes into a safety mode which limits the top speed to 35 km/h. However, if the choke is pushed down into the closed position, the electric Activa can hit a top speed of 65 km/h. The builder of this electric Activa has used Samsung lithium-ion battery packs for his e-scooter. He claims that the battery pack allows the electric Activa to easily travel a distance of up to 85 kilometres on a single charge. The battery is charged using a 3A charger, which can repower the battery range in 6 hours. However, Prince claims that more powerful chargers (up to 50 A) can be used with the battery pack to provide faster charging which can fully top up the battery in around an hour and a half. There are quite a few mechanical changes done the Activa. These include the removal of the engine and everything else related to the old fossil fuel powerplant. The builder has also fitted a bespoke swingarm and has fitted a disc brake at the rear wheel. This is also where the motor has been fitted onto the scooter. The battery pack sits where the fuel tank used to be on the petrol Activa. Finally, the builder has made a few cosmetic changes as well to bike as well. Gone are the Activa’s original headlamp and indicators. The headlight unit is now a rectangular LED unit, while the indicators are now fitted to either end of the handlebar. The bike also features a new starting procedure to get it going. This calls for the owner to press the right brake lever after turning the key to get the electric scooter ready to go. Honda currently does not produce any electric scooters in India but this DIY engineer from Punjab may have just given us a way to give the Activa a new electric life. While the costs are not what you would call easy on the pocket, they do show us that it is quite possible to make an electric vehicle on your own. With the government finally getting behind electrification, who knows maybe these genius DIY builders could show them the way to go forward.